The Classic Morgan 40 Ketch was designed to take a cruising couple to the islands in comfort. It evolved as a cruising version of the Morgan 41 keel-centerboard design. It has an aft cockpit unlike the Morgan Out Island 41 which was designed primarily for the charter business. This boat is about a ton lighter than the Out Island 41 and sails well. Its shallow draft guarantees youll be able to make it into your favorite anchorage by happy hour. Margaret Anna had a new 60 h.p. Isusu Marine Diesel installed in 1989 and has very low hours. The electronics have been upgraded to a Garmin Map 232 GPS and a Raytheon Depth, Speed and Distance Log. 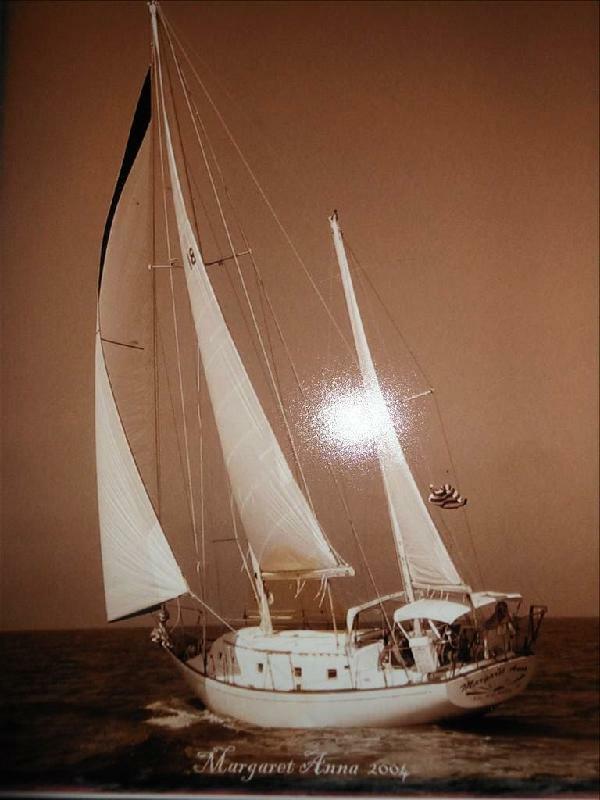 The mainsail and mizzen were new in 2003 and 2004, respectively, and have had little use. The boat needs very few upgrades before shell be ready to sail you into the sunset. A lot of boat for the money! MAKE OFFER! Upon entering the cabin, the first thing you will notice is the nicely finished parquet sole. Excellent ventilation is provided throughout the cabin with ten new opening ports with screens and a large opening hatch in the forepeak. To starboard is the galley with double stainless steel sinks and outward of the sinks, one of two ice lockers. This ice locker is equipped with a newer Adler Barber refrigeration system. Next to the ice locker is a three burner Force 10 propane stove with oven and to the left of the stove you will find another large ice locker. Outward of this ice locker, is a Panasonic Microwave. There is ample storage both below and above the galley area. On the port side you will find a large u-shaped dinette which seats six. Looking aft while sitting at the dinette, you will see a shelf and bulkhead where the Icom VHF radio and a new electrical control panel is located. Working our way aft, to port you will find a very large and comfortable settee/berth along with a pilot berth above the settee. On the starboard side is a matching settee/berth with a shelf above. There is plenty of storage space both below and above each settee. Aft of the two settees, is a good size head to port and a large hanging locker on the starboard side. The head is nicely decorated with small blue tiles on both the sole and sink counter. The sink is stainless. The forepeak sleeps two with a large vee berth and filler. There are a large number of storage lockers above each settee. On deck, the cockpit seats six and the skipper in comfort. On the stern rail, you will find dinghy davits with a block and tackle arrangement. At the wheel, is a large Danforth binnacle compass along with a newer Raytheon Depth Sounder and Speed & Distance Log. The boat also has a Simrad Autopilot. A large bimini covers most of the entire cockpit area. Both the cockpit bimini and the mainsail and mizzen sail covers are almost new and show very little wear. All winches are original Lemars; 2 - #40 cockpit sheet winches; 1 - #16 cabin top mainsheet winch; 1- #8 mizzen mast halyard winch; 2 - #8 main mast halyard winches. As you make your way forward on either side of the trunk cabin, you will notice that you have a very large area to walk on. On deck safety is provided with double safety lines connecting the stainless steel bow and stern pulpits. You will also notice the newly painted deck and refinished teak handrails and bulwarks. Not only will you find bow and stern cleats but midship cleats as well. A 50# plow anchor with 200 of all chain rode is provided as a primary anchor, while a 30# danforth with 30 of chain and approximately 200 of nylon rode is used for a secondary anchor. The boat is equipped with an older operational electric windlass. Removing the companionway steps, reveals the 60 hp Isusu marine engine. The engine was new in 1989 and now has approximately 730 hours. Engine accessibility is excellent! The boat does have a Cruise Air A/C Unit but it is not hooked up at this time. Ship power is functional with both 12 volt DC and 110 AC systems on board as well as 30 amp shore power. The boat is also supplied with a Chicago 2000 watt Heart Interface Inverter and a Guest 10 amp battery charger. The boat is rigged as a masthead ketch. All standing rigging is stainless steel with some swage fittings replaced with mechanical fastenings. The mainsail and mizzen sail were replaced a few years ago and are in excellent condition. The headsail is in good condition and the roller furler works well.